Chef Sucre Café is a petite French Bistro with a delectable Latin twist. 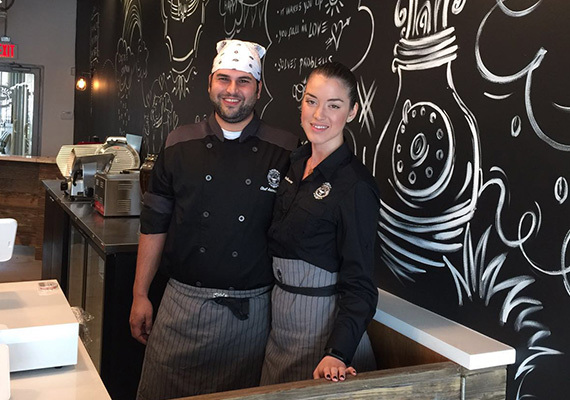 Located in the heart of Historic Coral Gables on beautiful Biltmore Way, Chef Sucre Café serves delicious moderately priced meals in a cozy setting. The Chef Sucre Culture is firmly rooted in the local community. Its owner Chef Antonio Sucre, graduated from Johnson & Wales and Le Cordon Bleu culinary school. Chef Antonio is well known in the area, with more than eight years of experience working as an Executive Chef in renowned local restaurants like Cacao, Café Vialetto, Crazy About You and Love is Blind. Chef Sucre Café offers out of the box flavors, every meal is distinguished for its handcrafted character. Start your day with an aromatic freshly brewed coffee and satisfy your sweet or salty cravings with the best food in town! On the light side, try our guilt-free, gluten-free spread worth every bite. Come visit us! Meet Chef Antonio and Lisandra. Experience their passion for serving the best food and providing great service.